It certainly is true that Slot machines are very popular these days whether they are in person at a casino or at an online casino. Online casinos in particular have jumped in popularity due to the ease with which one can climb online and play at their leisure. One can actually sit down in their pajamas and play slots to their hearts content. In person slots and casinos are still very popular too. One only needs to head to Las Vegas, Atlantic City or any number of other casinos in the world to see oceans of slot machines that are usually full of excited players. Slot machines are like any other type of gambling in that they draw out the folks wanting to game the system. Slot machines can be highly addictive and therefore there will always be a group of folks that are capable of being manipulated in their addictions. 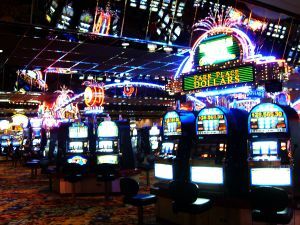 The systems that you see advertised all the time as being capable of helping you win at slots 100 percent of the time are exactly what they appear to be—manipulative attempts at taking advantage of addicted personalities. Let it be known that there is no such thing as a guide that can help you win every time out. This is true of online slots as well as in person casino slot games. There are some guides that can be helpful in learning about how to play and increase your odds, but nothing is going to make you win every time. That is simply wrong. When you head out for a night of playing slots, you should always consider exactly how much you can afford to lose. Set up a budget for the evening and make it difficult for you to stretch beyond that point. Some people say to make it impossible by leaving your money at home, but this can lead to emergency problems. The best strategy is to bring along a specific amount of cash and only bring your card otherwise. Granted you can always go and pull money out at the casino, but if your control is that far gone you should not be playing at all. Set a budget and stay within it. When you play online, you have to be even more disciplined. It is very easy to want to simply load another deposit after losing. Set a budget and refuse to budge when you lose. Move on and do something else when your session is over. Don’t hang around for the free games because that will raise the odds that you will break your budget. Another way to ensure that you stay in budget is to play games that fit your budget. If you have fifty bucks for a session of playing slots and you play five bucks per roll, you are probably going to be finished far before your friends. Consider the penny and nickel slots when you have limited budget. You can still win big on those machines and may be able to slowly build to larger payout machines by winning on the smaller ones. Slot machines come in all shapes and sizes and they all offer payouts based on what pops up on the screen. The majority of them flash up symbols that will bring you various amounts of money based on the order in which they appear. All of them offer up something called a pay table that you can look at and understand what is worth what. Study this pay table carefully and make certain you understand what you need to do to win at this game. If you are uncertain, ask questions of the staff. Some of these slot machines allow you to choose a couple of symbols to save and spin again. These are called re-spin slots and they can be complicated if you don’t understand how they work. Learn the games first before playing and your odds of doing well double or even triple. Jackpots are offered on many slots that are basically payouts that come randomly or when a specific group of symbols appear. You often have to bet a certain amount to have the chance at these jackpots. This is where playing the right game for your bankroll becomes so important. Betting the maximum requires that you have enough money to do so and play for a while within your budget. You don’t have to bet the maximum, but if you don’t bet enough to have a shot at the jackpot then you are wasting a great extra odds booster. Hitting a jackpot is in addition to any normal winnings you might get so it is foolish to not add those odds to your gameplay. When you are losing at slots, the natural urge is to increase the bet and get your money back quickly. Slow and steady is the better option because they tend to come around. If you try to do this method of betting, you will likely lose your bank roll even faster. If you have ever been to a casino in real life, you have seen the folks that everybody avoids like the plague. There are folks that go around and watch for people loading up on one machine. They then wait for them to get up and slide in to try to swipe the booty. While the advantages of doing this are arguable depending on who you ask, it is considered rude by everyone except those that do it. Don’t do this. Spread around your bank roll to various areas of the casino for your best chances. Some feel that you are better off spending your money on one machine feeling that your odds get better the more you lose. I can understand that logic but I have always done better by spreading out. I have a whole lot more fun on slots that way as well. Many casinos, both online and in real life, offer up all kinds of bonuses for joining a club, sharing your email address and the like. Take advantage of these offers when you can. Any house money you can acquire will increase your chances of winning on slots long term. Sign up bonuses and various other programs are wonderful if they are done correct. Just make sure you are dealing with a verified, respected casino. Slot machines can mesmerize you rather easily and time can get away. While the effects this can have on your wallet are obvious, it can also affect your health. Sitting at a slot machine for extremely long periods is not good for you at all. Set a time to stop and stick to it. Also, have a limit that you will stop at if you reach it. Many people get ahead and can’t walk away. Know what you would like to win and take it when you get there.